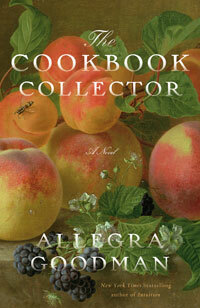 I picked up The Cookbook Collector after hearing a bazillion reviews calling her the next Jane Austen. Cause who can resist Jane Austen? I admired how the author intertwined the lives of Save the Trees enthusiasts with antique book dealers and dot com millionaires. As unlikely as it seems, it kind of worked. However, I don't really get the Austen comparisons at all. She does write about the wealthy and the not-so-wealthy but manners and society don't play as big of a role as I'd expected. I was a bit let down. Towards the end of the novel, the author co-opts a major historical event as a plot device. Unless its handled extraordinarily well, I kind of hate that sort of thing. My other pet peeve is that the story begins with a description of the two heroines - two such beautiful and uniqye ladies you're never likely to meet. This sort of thing strikes me like how tales are told to small children - with only the most beautiful and perfect characters. The sisters turn out not so perfect, but my initial annoyance was hard to overcome. It was a fun read, but I very much doubt that it'll stick mith me. 4/10.